We accept cash or check payments. At this time, we do not accept debit or credit card payments. We do not serve alcohol, however, customers can "Brown Bag" (bring in) their own wine and alcohol. There is a minimum set up fee per customer who uses the Brown Bag privilege. ONLY BEER & UNFORTIFIED WINE CAN BE BROUGHT IN FOR CONSUMPTION. LIQUOR & FORTIFIED WINES (GREATER THAN 16% ALCOHOL) WILL NO LONGER BE ALLOWED. WE APOLOGIZE FOR ANY INCONVENIENCE THIS MAY CAUSE. 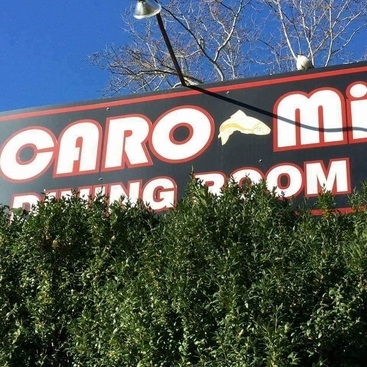 Welcome to the official website of the CARO-Mi Dining Room! We are excited to announce a new Entree addition to the CARO-Mi menu.....GRILLED CHICKEN!!! Enjoy a nice 8oz. 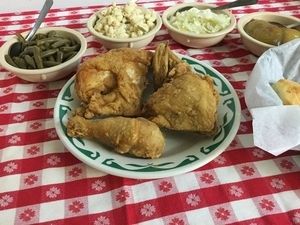 Boneless, Skinless, Butterflied Chicken Breast prepared on our flat-top grill and topped with Rotisserie Seasonings served with all of our side dishes: Macaroni Salad, Our Famous CARO-Mi Slaw, Green Beans, Cooked Apples, & Biscuits, and as always, all our side dishes are all you can eat. So plan on joining us for your dinner of Grilled Chicken but it will BE AVAILABLE WEDNESDAYS & THURSDAYS ONLY. Call us now for Reservations. 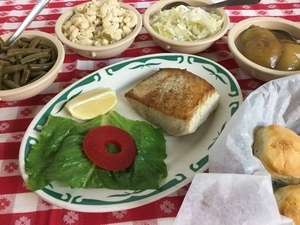 SPRING 2019 is upon us and we have all the ways to satisfy your warm weather appetites. Plan now to join us for all your Birthdays, Anniversaries, Graduations, Reunions, Date Nights, and Just Because Nights. 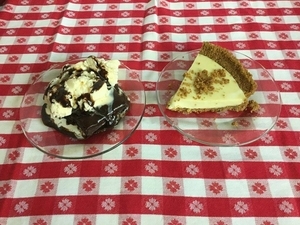 We look forward to having you come in for dinner and stay for dessert. 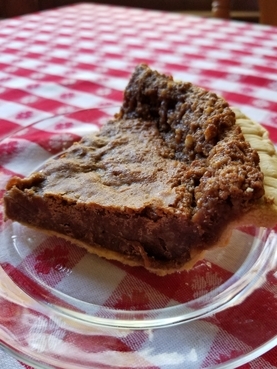 Chef David has decided to add another offering to the Dessert Menu in honor of our Great State of North Carolina...Homemade Tarheel Pie. It is a delectable mix of Butter, Walnuts, Sugar, Hopes, Dreams and Chocolate! It joins our scrumptious other slices to make it a Dessert Trio. 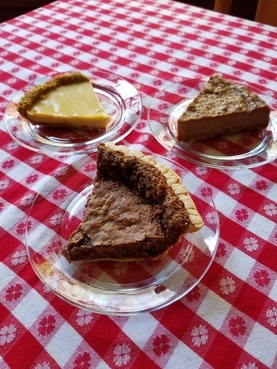 Homemade Tarheel Pie is now apart of our Sweet Offerings of Homemade Key Lime Pie and Homemade Praline Cheesecake. And due to the popular demand of our Homemade Praline Cheesecake, which previously was only available November- February, our Chef has decided to work it in his busy schedule to make it available Year-Round, along with other Seasonal Desserts throughout the Spring and Summer. Make plans now to have a Sweet Treat with us & remember STRESSED spelled backwards is DESSERTS! 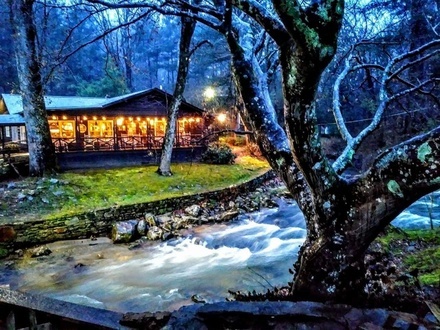 You can now make reservations with us through Facebook Messenger. 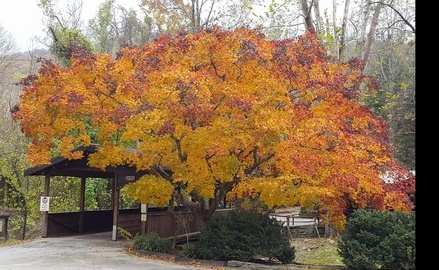 We Are Open Year-Round Wednesdays- Saturdays. We Are Only Closed the Week of Thanksgiving, the Week of Christmas, & the Week of New Year's. Fried Sea Scallops. Hand-breaded in house. USDA Choice 10 oz. Ribeye Steak. Pan Sauteed Fresh Chicken Livers. N.C. climate cured country ham. No nitrates or nitrites. Served with grits & red-eye gravy. Pan sauteed. 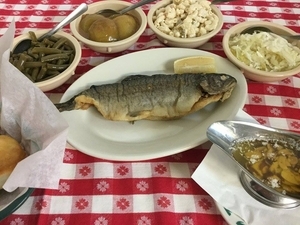 Filleted table-side, served with toasted almonds and melted butter. 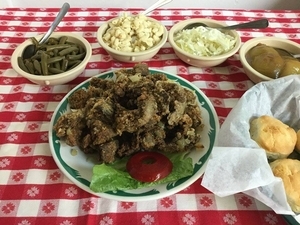 Hand-breaded, served with homemade cocktail and tartar sauces. Seasoned with your choice of lemon, salt and pepper or blackening seasoning. 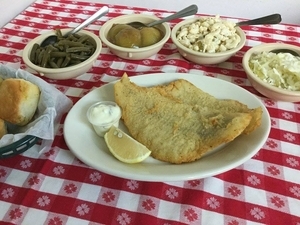 Hand-breaded and served with homemade tartar sauce. 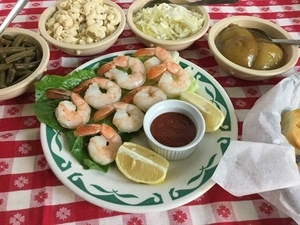 Shell off, served with homemade cocktail sauce. 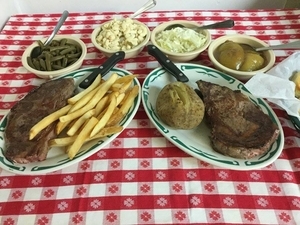 Served with your choice of baked potato or french fries. Seasoned with our Chef's secret blend of spices, breaded, and cooked to perfection. 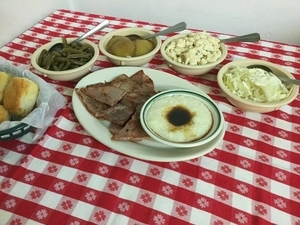 *the vegetable plate includes a baked potato and the sides that are included with all entrees. The vegetable plate is also the minimum adult plate share charge. 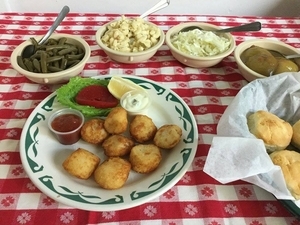 Caro-Mi slaw, macaroni salad, green beans, cooked apples and biscuits. 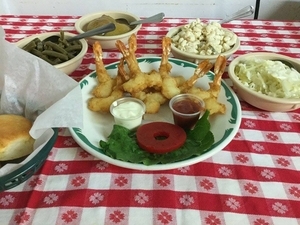 We offer smaller portions of ham, chicken, shrimp, scallops, cold boiled shrimp, chicken livers, chicken tenders and vegetable plates for children at half the adult plate price. Our Chef and Kitchen Team strives to ensure proper measures are taken to prevent cross-contamination of allergen foods. Please let your server or the manager know if you have an allergy or special dietary requirement and we will do everything possible to meet your needs. Please note that consuming raw or undercooked meat, poultry, seafood, or shellfish may increase your risk of foodborne illness.